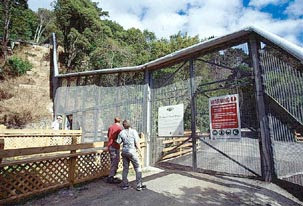 You would be forgiven for thinking that you had just arrived at Jurassic Park when you walk up to the gates of Karori Wildlife Sanctuary. Unlike Jurassic Park, however they're not trying to keep the wildlife in, but the wildlife out! Here's a pic of the gates I borrowed from the web and one I took which shows the two metre high fence that surrounds the entire park. If you arrive at the weekend or during the summer you have a choice of transportation, your feet or the electric boat that runs up and down the lower lake. The boat leaves from beside the old pump house more or less at the entrance. There are two distinct levels to the park consisting of the lower and upper lakes. Here's a pic of the pump house and the boat. We made our way on foot, up to the second set of fences within the park where we took the following pics looking back along the lower lake. The park is divided at its centre by a second temporary fence in order to keep the flightless birds such as the Weka within a certain area and protect vulnerable lizards and invertebrates. You might think that using Jurassic Park as a metaphor is a little far fetched, however it's the Tuatara pictured below that makes the comparison a little more plausible. Tuatara are from an order of reptiles that evolved around 220 million years ago and became extinct everywhere except NZ. There are some more interesting facts about the Tuatara's here. The Tuatara are not that easy to see. The second pic below is a cropped version of the first. If you can't see the Tuatara in either not to worry as they have notice boards up at the beginning of the track where the public and guides can mark down where they have spotted them to help the less eagle eyed! You can test your eye sight on the pic directly below! I mentioned in a previous post some time ago that the Kea was NZ's only parrot and rightly got a "slap on the wrist" from Loose Yarns & UFO's who reminded me of the Kaka! There are feeding stations in the park for these parrots and if you are lucky one or two might come and feed while you are there. We were lucky and got the following pics when we passed it on our way back from the upper reservoir. The last pic is the middle pic cropped. We were lucky enough to see the Kaka both times we have been to the park. However this time we got to see it actually eating and drinking from the feeding station. The feeder is very clever and works on the fact that the Kaka are such large birds. They literally land on a perch/ lever and their weight acts as a counter weight to lift the lid of the feeder letting them access the contents and means that the smaller, lighter birds cannot take their food. The pic below is taken from the dam at the upper reservoir looking back over the park. We joined the growing membership of the park the last time we were at the park. Membership entitles you to free entry to the park at any time and you also get a discount for the guided night walks which we hope to do before we go home. On the night walk there is a chance you will get to see glow worms and the nocturnal Kiwi amongst other things. If you only had a few days in Wellington and your time was limited I am not sure whether everyone would find the sanctuary a good use of their time. It is a great place to spend a sunny afternoon however and there are plenty of places to sit down and listen to the amazing sounds of all those NZ birds. The Bellbird I think is my favourite. PS I will start posting about our trip up north tomorrow just wanted to do this post while it was fresh in my head. PPS You might have noticed the new counter that Sharon put onto the side bar. We are heading home on the 27th September 07 for two weddings and we, like the counter, are literally counting down the days! Great pics of the kaka and tuatara! Lovely pics you got. We used to live in Northland looking across to the valley where the Sanctuary is, at the time it was being built, and we still visit occasionally but haven't done the boat ride yet (kids are desperate to).